Rippleside Park, 8:30am, 3C, raining. The carpark is deserted as ride leader Helen checks out whether our intrepid members have braved the elements. “No takers. Sensible people. Back home to a nice cuppa and shower,” she thinks. Headlights break the gloom. It’s GTC ride leader John, on the trusty (but slow) hybrid bike, bedecked in full wet weather gear from head to toe, and Peter – in cycling knicks and flimsy rain jacket (already saturated). With these genuine Tour-de-France conditions, the three set off to the north with (at least in Helen’s mind) the option to pull out at any point if the going gets too tough. The ride around the waterfront to Foreshore Road was damp but pleasant assisted, maybe, but the-less-strong-than-forecast southerly. After turning west, the northern most end of the Ted Wilson Trail was reached, with the rain no more than a gentle, insistent drizzle. It wasn’t till the end of Pioneer Road that the group realised they were not alone! A figure lurked off track – the paparazzi was stalking the tour in the form of Noel from GTC. Thanks Noel for some great photos. Coffee was at Soft in Minerva Road. It was essential that the cyclists maintained their damp persona – Peter’s freezing hands obliged with coffee cup flying across the table. John and Helen’s rain pants stood the test well! Unfortunately, the paparazzi’s camera wasn’t ready, and it didn’t seem wise to try the manager’s patience to set up the shot for a second time. The route continued over the river at Queen’s Park and across to Baannip Boulevard (a great run downhill with a tail wind), then back to the waterfront at Garden Street, with John and Peter leaving the tour at various convenient points. Despite the conditions (it didn’t really stop raining for the entire ride), it was a most enjoyable circuit, good company and an enjoyable route. 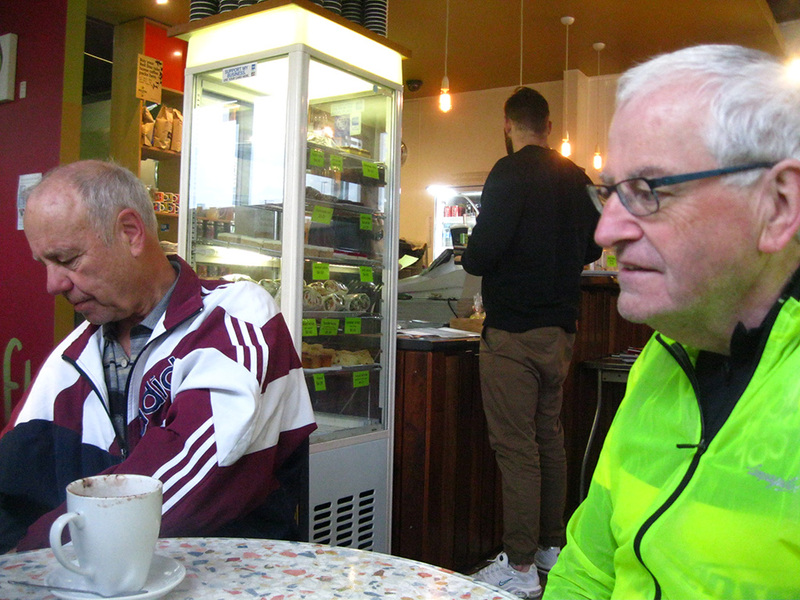 Thanks to John and Peter for joining the lone Cycling Geelong rider, Helen. This was a wonderful way to spend a wet Sunday morning. This entry was posted in Ride reports and tagged Soft Cafe Minerva Road, Ted Wilson Trail by hlyth2013. Bookmark the permalink.